6/8/2016 I just drew the ACE OF HUNGERS card, and am now seeking Mr. Eaten's name. 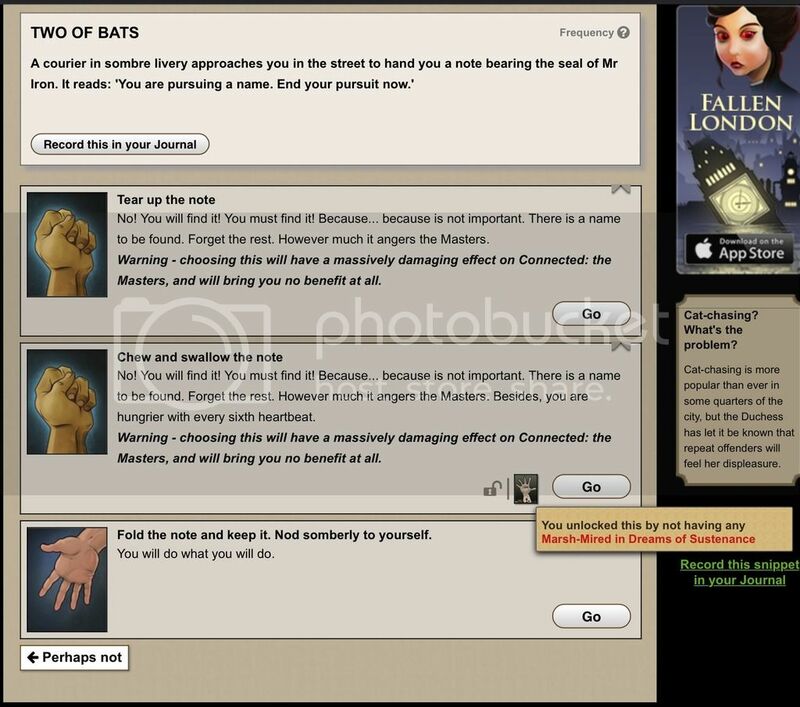 It seems that at long last, this storyline has been unlocked! 6/8/2016 And I just drew the Two of Bats. I welcome social actions, and can visit your salon as an author. 6/8/2016 AT LAST A RECKONING. I'm rousing my sacrificial alt from his prayers right now. Hungry, Weft? You will be. Hello, savoury persons. Shall we become acquainted? 6/8/2016 So, I'm in a bit of a dilemma with this now. I have no desire to seek. However, my significant other in FL does, and I wish to support him in his foolish errand. WHAT DO? Persuasive patron. You want a lesson, send me a message asking for one. So, I'm in a bit of a dilemma with this now. Tell them not to seek, beg them, do not let them seek, it only leads to suffering and death. Maybe the power of love can overcome? You know what they say about the deepest matters of the Bazzar. 6/8/2016 I just drew this one. I'm super excited to start ruining my own life but I can't help but wonder if the are other, less valuable things to give up on the way in. What does the ace of hungers do to you? Never mind, just drew it. Wow, that is a lot less painful. I am, at last, seeking the name. Goat Farming or Cider Brewing? This browser extension may help. Want a Cider sip? Please refer to this guide before requesting. Scholaring the Correspondence? A Brief Guide to Courier's Footprint. Contemplating Oblivion? First Steps on the Seeking Road. Gone NORTH? Opened the gate? Throw your character in a well. If you fail, you can only cry and hope they don't die, go insane or go to prison too many times. And that amount of times is to the final death, till i have seen every madness, and till I'm the most wanted man in the neath. I will not abandon him. 6/8/2016 For those who don't want to tank their connected masters right away, if you wait for the ACE OF HUNGERS card, there's an option to get SMEN 1 and Marsh-Mired in Dreams of Sustenance 1 at a cost of just 400 honey. There are other options on the card too, but I have no idea what their effects are. Just to be clear: has anyone drawnone of these without already having Unaccountably Peckish? Mostly to advise newer players coming in for the first time. 6/8/2016 How would one go about seeking the Name? I have no desire to ruin my main character, but I have a suitable sacrificial alt. Do I just need Unaccountably Peckish or are there other requirements? 6/8/2016 @Jimmy: there is an airs-locked story in the FQ which will trigger it if you meet the requirements. Will do all socials except Loitering or Private Evenings (all my Free Evenings are accounted for), and Affluent Photographer Betrayals only, please. I am not currently accepting calling cards. 6/8/2016 Holy smokes. I was pumping up Unaccountably Peckish just for giggles with the Dinner with Devils card, because I had no idea what it was for. Suddenly my opportunity deck is lousy with these things. Incidentally, teeth are surprisingly tasty. 6/8/2016 I got TWO OF BATS, THREE OF ROSES, and KNAVE OF REGRET. They all seem to be related to Unaccountably Peckish. Gone NORTH. It's nice here. 6/8/2016 I too, have drawn the Ace of Hungers. 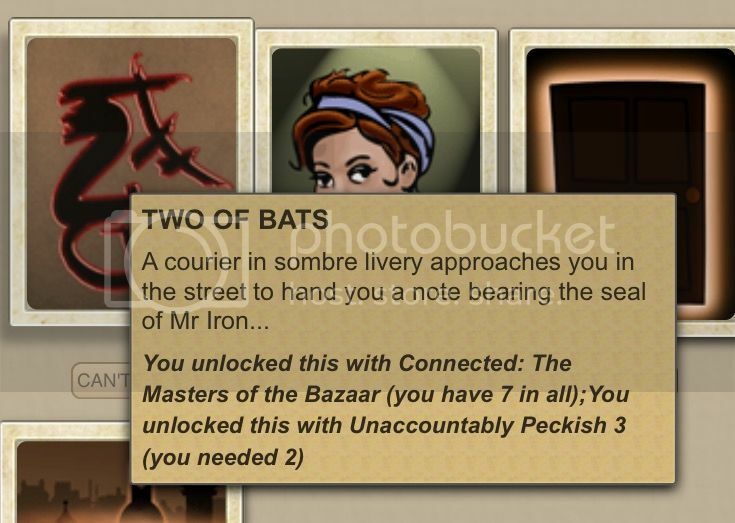 From what I can see both of the card I've got and the Two of Bats screenshot above, it seems that the Ace requires Unaccountably Peckish 1, the Two requires Unaccountably Peckish 2. So I wouldn't be surprised if the rest required increasing amounts of U.P. They do. The THREE OF ROSES, FIVE OF LIGHTS etc. 6/8/2016 In any case, if you are considering seeking you should make up your mind. Either see it to the bitter end or just don't start it - abandoning it in the middle is the worst idea in all circumstances. No dabbling for this one. 6/8/2016 @Kittenpox: fool, fool! Stop now before it's too late!